BOOM, written, directed and performed by Rick Miller is an interesting beast. The show is sort of a live documentary about the lives and times of the baby boom generation; the large cohort born after the Second World War. BOOM is part history lesson, part nostalgia trip, part musical tribute concert and part multimedia slide show. It’s not nearly as academic an exercise as it sounds and it’s surprisingly entertaining. I’m not a Boomer (I’m actually on the leading edge of the much maligned Millennial generation). What drew me to see BOOM was Rick Miller. I first saw Miller when I was still in high school and he was starring in MacHomer, his solo production of Macbeth recast with characters from The Simpsons, all played by Miller himself. I was as captivated by his performance then as I am now, Miller is a gifted impressionist and a dynamic stage artist. At the top of the show Miller introduces us to three Boomers in his life; his parents and an old family friend; all of course played by Miller with a skill and conviction that allows the impressionist to fade away and the characters to come to life, it’s really a remarkable effect. Each of the characters starts their narrative in a different place; Austria, the Southern US and the town of Cobourg, Ontario. A collage of cultural references and historical events is filtered through these characters’ lenses as their disparate narratives progress from 1945 through 1969. Throughout the show, Miller gives us an array of stunning impressions; from historical figures like Presidents Truman, Kennedy and Nixon, and Winston Churchill, to cultural figures like John Lennon, Jimmy Steward, Elmer Fudd and Bugs Bunny as well as the entire cast of I Love Lucy in an entertaining bit where he provides the voice for every character in a scene from the classic sitcom. Then of course, there’s the staggering array of musical acts including Tony Bennett, Little Richard, The WHO, Elvis Presley, Buddy Holly, Joe Cocker, Janis Joplin and David Bowie. The musical interludes are just long enough to give the audience a taste of the songs and for Miller to show off his incredible skills as a mimic but brief enough so they don’t unduly stop the flow of the narrative. While the kaleidoscopic nature of the show made it feel unfocused in the first act, I thought the show really hit its stride in the second half when the three narrative threads converge and intertwine beautifully against the backdrop of heady historical events of the late ‘60s; Civil Rights, the Vietnam War, and the space race, all of it underscored by Miller’s jaw-dropping, spot-on impression of Joni Mitchell performing “The Circle Game”. 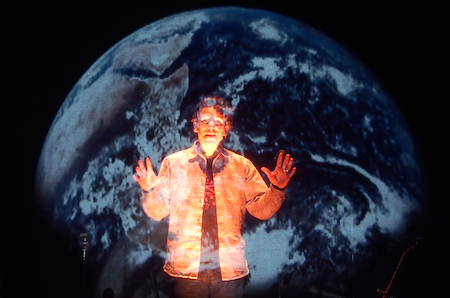 Throughout the show, the narratives are augmented by David Leclerc’s projections which cover the stage creating a dazzling array of effects. The one drawback to this use of technology is that Miller performs almost the entire show behind a scrim which cuts him off from the audience. Performing behind a screen makes it harder to really engage with the audience because it takes away the direct, intimate connection and at times it almost felt like I was watching a movie rather than a live performance. The size of the venue, the Panasonic Theatre, didn’t help. I felt it was a bit too big for the scale of this performance and I think the show would play better in a smaller house; the energy of the performance didn’t translate particularly well in the larger auditorium. I also thought the two-act format wasn’t necessary. The show felt a bit long to me and I think editing it down to a 90-minute no intermission format would tighten it up and really make the show pop. Regardless, I enjoyed BOOM and found it accessible and entertaining even though I was unable to share in the knowing glances and sighs of recognition and nostalgia of some of the Boomers seated around me. Go for Rick Miller’s amazing impressions, his talent transcends generations. BOOM is playing from January 15 to February 1, 2015 at the Panasonic Theatre, 651 Yonge Street, Toronto. Shows run Tuesday to Saturday at 8:00 p.m., Saturday and Sunday at 2:00 p.m., and Wednesday, January 21, at 2:00 p.m.
Tickets $25 – $79. Discounts for groups of 12 or more. Tickets are available in person at any Mirvish theatre box office, by phone at 416-872-1212 or online at Mirvish.com.